Email vendors are increasingly offering platforms with more multi-channel functionality to give marketers a more holistic view of their customers to send more relevant messages – not just more email. In the transformation from email only to multi-channel marketing, what should you consider and how can you make the most of the process? According to the 2014 Email Census by Econsultancy, only 31% of companies report using multichannel triggers, with a lack of strategy and integration being in the top 5 biggest barriers to effective email marketing. If you’re considering the transformation from a single channel (email only) towards a more multi-channel marketing approach, here are some considerations, and ways to make the most of that process. To build a more holistic picture of customers from multiple channels, brands need customer data. This means they need stronger “owned” channels, from email to social and a great website presence. There are two major reasons for creating stronger owned channels. You get to “own” the customer data from these channels. If used well these will give you actionable insights at-scale and knowledge about your customers. Customers are increasingly expecting brands to have an owned channel. If the brand doesn’t control that channel, customers will – think of review sites for example. Most brands are realising they no longer need to rely solely on 3rd parties to connect directly with their customers at scale, but with this realisation comes great responsibility as well. Before you start collecting customer data (or continue to), you need to know what you want to get out of that data, and ensure there are processes in place to ensure its usability. 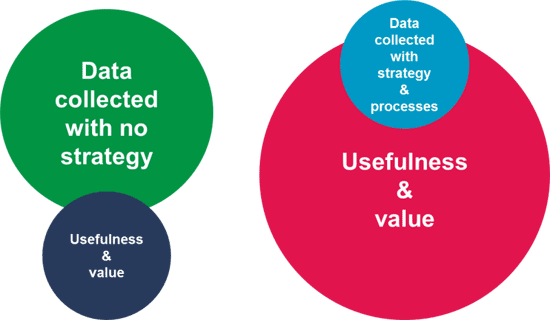 It’s particularly essential that your data strategy is understood and practised across teams, so that the data feeding your execution is actually useful, usable, and valuable. Quality data trumps big data. Ask for hyper-relevant data, not just generic demographic data. For example, instead of asking for annual income, ask for average spend on your product or service – an answer which you’re far more likely to obtain, and be able to action more usefully. Collecting and deploying data according to a solid strategy will also establish trust with your customers, because they will be able to sense when you use their data wisely (and for their benefit, not just yours). Here are a few interesting examples of how good data use boosts engagement with mobile push notifications, as well as some examples to avoid – complete with customer reactions on social media. There are great cost savings in sharing data, breaking down silos and using data for more than one purpose. For example, consumer promotions are often run traditionally to just drive sales. However, brands are now getting more out of the attention these promotions capture by building their subscriber base too. Once that subscriber base is established, brands can then use their new “owned” channel to incrementally capture more data about their customers, and better engage customers with insights from that data. Using promotions to achieve their customer acquisition targets also improves the ROI of each promotion. The total data captured over time from multiple channels is a good start to the dream of a single customer view but certainly does build an integrated customer profile. This is used to help brands prioritise future marketing activities. If you expand this thinking to your entire marketing effort, there are far more wins to be had. As Scott Brinker of Chief Martec says: “Marketing is increasingly about designing and delivering customer experiences, and software is the digital clay we use to sculpt them.” If software is simply the digital clay, make sure that first and foremost, you have the design (the strategy) and the ability to deliver (the technical execution skills). There is a reason that ongoing services matter in the hunt for an ESP. Once you have a firm idea of what you want to achieve, and a rough idea of what channels are most important to you, a natural “shopping list” of features will flow from that, so you can pick the platform with strengths that match your strategic focus areas. Looking long term though you may also want to consider where the platform can take you in future, because with multi-channel platforms, it’s less easy to make a simple switch than a single-channel platform. Does the platform integrate customer data well from at least 3 of the core channels you use to communicate with your customers/prospects? Can the platform be used to build an integrated customer profile, pulling data from the channels determined above? Does the vendor include any strategic services in the set up phase to ensure you have the capacity to use each channel effectively? Does the vendor provide ongoing services to ensure you’re able to implement the marketing platform and turn features into real value? Is the vendor adaptable to your needs in the next few years, not just the next few months? Of course a multi-channel approach can help you deliver more relevant content, but relevancy isn’t just about the message. Some of the greatest benefits to be had from a multi-channel approach is that you can contextualise your content to the right channel, time and place too. So ensure that you are considering where your audience will interact, at what stage of the customer journey and on what device. At some point you’re going to need better tools to help you scale your multi-channel efforts, not to mention the (in-demand) skilled people and potentially services to obtain value from a multi-channel platform. All of this means a sizable budget – but how do you justify that to those who can help grow your budget? Obviously different managers respond to different things, so consider whether to emphasise the numbers (showing ROI thus far and the potential for further growth), or the emotional. Sometimes bringing in a real customer story, or indeed a real customer, or more qualitative findings from a pilot can help your case stand out amongst the sea of digits.